Recently on Twitter, I came across a challenge. Users were asked ‘Describe Yourself In 3 Fictional Characters’ by posting a photo of each character. It was so interesting and entertaining to see people (some who I hadn’t really gotten to know that well yet) describe who they are with such well-known characters and in some way, I feel like I know them all a little bit more because of it. So, I thought I would take the challenge and expand on it a little bit so that you can also get to know my personality a bit more. Here are 3 fictional characters which I feel best describe who I am! 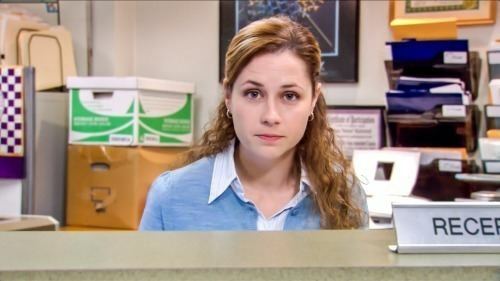 Let’s get the obvious out of the way: Pam worked as a receptionist for Dunder Mifflin and I work as a receptionist in my current job as well as every job I have had since I was 18. We are both pretty easy-going women who don’t seem to speak up enough when things might be bothering us. I can’t say I have had any cute co-workers pine after me while I was engaged to be married to someone else, but maybe that is a good thing. I have always identified with Pam’s loyalty towards her workmates, especially those who treat her with respect and kindness. I see so much of my younger self in Riley. Her devotion to her dearest friends (Maya in particular) is so reminiscent myself and my very best friend as a child. Her happiness and enthusiasm for life and everything coming her way was very similar to 13 year old me. Something I also related to with Riley was her overly-cheerful disposition. In fact, we were both made fun of for being so positive in high school. Kids can honestly be so nasty sometimes, can’t they? I have a tendancy to romanticize and fantastise about the most boring topics, just like Anne always seemed to. Visiting a new town sometimes feels like poetry to me, with new exciting and sometimes dramatic stories around every undiscovered corner to be told. Anne’s love of writing is very much a part of who I am and I am constantly thinking up scenarios in my head involving either people I know, or brand new characters. Which fictional characters would you use to describe yourself?